To be honest I found out about Fi while listening to the latest project by "Chuku100", the few features on that tape were dope. I have been covering the Khalaezzy Game movement for a while. 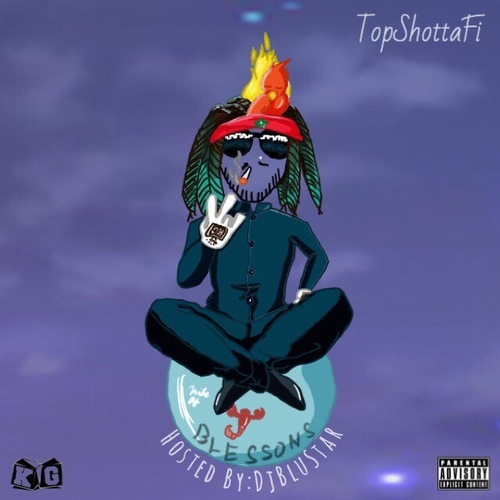 BLessons is the title of this project by DMV artist "TopShottaFi" Hosted by DJ Blustar. His style is a little more different than most they call him the spitta and many times its proven. He goes straight in on the "New Level" intro letting the listeners understand how he is coming. DMV producer "Juggin Sweizy" was behind 90 percent of the tracks on this project, providing a griddy old school feel. Fi's style is a mixture of bars and making an actual song, "Really Popping" and "No Feelings" both have a message behind them that he was trying to get us to understand while the hook will be stuck in your head. I think thats a good thing for replay value. I like "No Feelings" its a cool song for whats going on in the culture today lol. The skits are pretty different I was confused until I heard a skit midway through the project, maybe they are incomplete songs that wasn't used, fun in the studio, and or just talks with the crew. I guess thats an interview question of course only thing I can do at this point is take a educated guess until the the actual answer is told to me. good car music for a guy like me ..
realist tack on the project. just the music, its more personal ..
on this project and they actually go in! and with good flow on the beat! "Chuku100"
ladies, and its crazy i just listened to that a few times!